Right side: Sir Conrad Swan, A.B. (Bunny) Henwood, Gerard de Roeper, Enver H Chaudri. Over the centuries the Abbey of St Edmund was built as a fitting place to house the tomb of St Edmund, King of the East Angles, who was murdered by the Vikings in 865 AD. Soon after his death, miracles began to be attributed to him and thus the Abbey grew and prospered. The small town also flourished round the Abbey, and became known as Bury St Edmunds. It was totally under the fealty of the Abbey and had no armorial bearings of its own. The people resented the fact that the Abbey charged them rents and tithes on virtually all property, and since the Abbey owned all the land that we now know as West Suffolk, practically every thing that moved had to pay fees or dues. There were several riots against the Abbey and twice it was set on fire, the first in 1327 destroyed the Abbey gate, and in the second in 1465, part of the Abbey church, in which it was thought the body of St Edmund lay, was destroyed. In 1535 Henry VIII ordered the Abbey to be dissolved and it was plundered of all its valuables. It was not long before the town’s people set about destroying it; the stone was pulled down and sold by the cart load for local building. The people were delighted to shake free from the yoke of the Abbey but it was not until 1606, after several attempts, the town’s people were able to obtain a Charter of Incorporation with the right to carry maces. In 1663, these were commissioned and the incorporation brought the new Town Council the right to bear a coat of arms and they were granted a blue shield bearing three gold crowns. In respect of St Edmund’s death and the original Abbey, the crowns were made different by having a pair of silver arrows, crossed in saltire points down, thrust through them. They were also granted a crest of a seated wolf holding in its paws the crowned head of St Edmund. There was a story that when the Danes killed King Edmund they threw his head into the bushes and those later searching for it could not find it. But they heard a voice crying “Here I am! Here I am!” Following this sound they came across a large wolf guarding the head. They took it up, unharmed by the wolf, who meekly followed them. The head was laid with the body and later, miraculously, became rejoined. Many years later during some repair work, the bones of a large canine were found interred in a wall of the Abbey which were said to be the remains of the wolf. The motto is Sacrarium Regis, Cunabular Legis that is - shrine of a king, cradle of the law. Firstly, this was because the body of King Edmund had been laid to rest here and secondly, that in 1214 - at great personal peril -the Barons of England and the Archbishop of Canterbury met together, in secret, to swear on the high altar of the Abbey that they would compel King John of England to agree to the issue of Magna Carta, the document which righted many civil wrongs and became the basis of our law today. Illustration 1. This is the plaque displaying the arms, taken from the Council Chamber of the Borough of Bury St Edmunds, the tinctures faded over time. The blazon is: Azure three crowns or each enfiled by two arrows, points down, crossed in saltire argent. 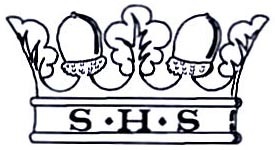 The crest: A wolf sejant in its paws the crowned head of St Edmund all proper. The motto: Sacrarium Regis, Cunabular Legis. After 1974, the Borough of Bury St Edmunds, the Urban district of Haverhill and the Rural districts of Clare and Thingoe were combined into the Borough of St Edmundsbury by Royal charter. 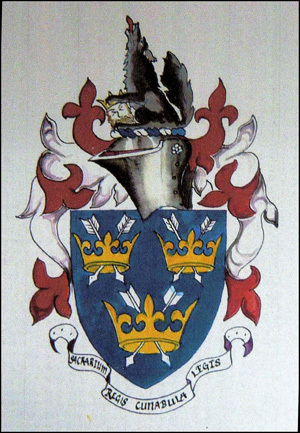 It was felt that none of the existing arms or badges correctly identified the new bodies and so the Borough Council petitioned through the College of Arms for a new grant of armorial bearings. This was duly granted and the ancient Town Council arms became redundant. At the same time, the armorial bearings of the Rural district of Thingoe suffered the same fate. In 2004 it became apparent that this change left the town without any specific civic representation or identity of its own and so a new Town Council was set up. 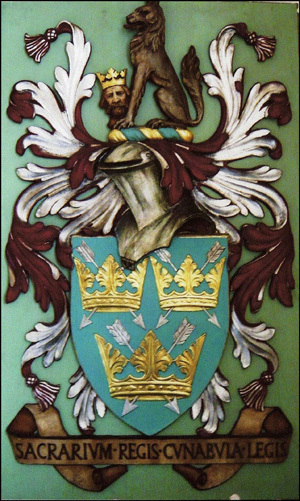 In 2006 the Town Council petitioned the College of Arms that as it was now the natural successor of the original Bury St Edmunds Town Council, could the coat of arms of that body be re-granted to the new body? This was agreed and confirmed by royal license by Her Majesty, Queen Elizabeth II in that year. These are thus the same arms as those originally granted by King James I in 1606. The drawing shows a slight difference. The wolf on the crest is drawn with his head back, shouting “Here I am! Here I am!” and though there is no blazoned instruction for this, the wolf is still “sejant” as it should be. Illustration 2. 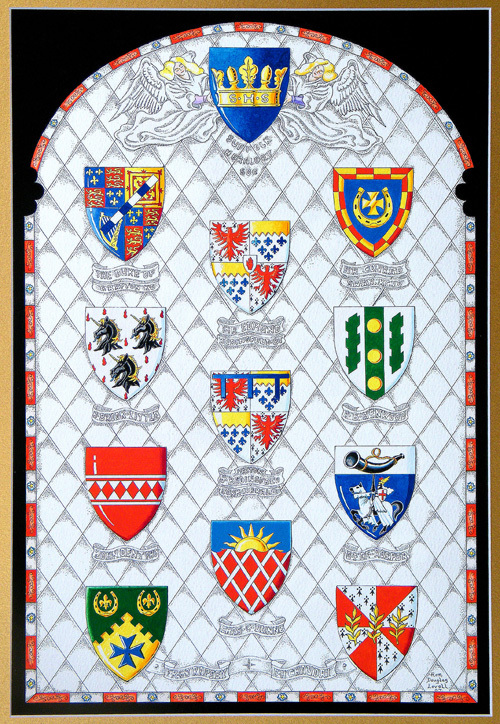 The Armorial Bearings of the present Bury St Edmunds Town Council. Designed & Hosted by Inspire Anglia © 2010-2019 Suffolk Heraldry Society, Reg. Charity No. 280689. All rights reserved. UK law applies.